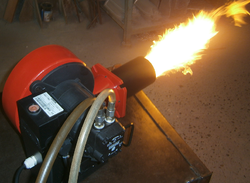 Our product range includes a wide range of air heating system and industrial burners. Air Heaters are used for process heating where there is requirement of hot air for any industrial or comfort heating application. 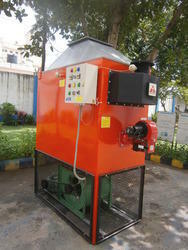 Hot air is indirectly heated through the heat exchanger which is diesel/gas/solid fuel fired. Temperatures up to 225°C can be achieved. The temperature control and burner operation is fully automatic. Air Heaters are manufactured by us from 25,000 kca/hr to 4,00,000 kcal/hr. Thousands of "Alfa-Therm" Air Heaters are in operation in practically every application all across the country and abroad. Pressure jet type monoblock fully automatic burners in oil and gas firing up to 1 million kcal/hr.